Modus Cleaning Solutions are here for all of your drive and patio cleaning needs in Lichfield and the wider Staffordshire region. Moss, algae and lichen can cause drive and patios to become green, dirty and dangerous. 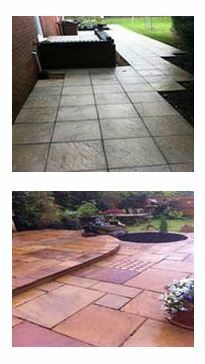 Using a high powered diesel pressure washer with variable pressure controls (which reduces the likelihood of causing damage to surfaces) drive cleaning and patio cleaning can be carried out to a high standard, with all external surfaces being bought back to life. Pre-cleaning treatments may be needed in certain drive cleaning and patio cleaning situations, for example where there is lots of moss or lichen on the surface a fungicidal wash may be applied a week or so before. This kills the infestation and allows the pressure washer to remove as much as is possible during the cleaning process. We offer the following packages which should suit the requirements of the majority of our potential customers. Options 2-4 can also be incorporated with the surface being sealed with a high resin content sealer.